Tucked away in the south west corner of India, Kerala is the ideal holiday destination and one of the best tourist destinations in India, far removed from the rituals of everyday world. Kerala boasts of a rich tradition and a deep historical background. Enclosed within is a criss cross of mossed backwaters, abundant wildlife, paddyfields, a rich land burstling with cashew, coconut and rubber plantations and a variety of spices like cardamom, pepper, turmeric and ginger, making Kerala the spice capital of world. Kerala is breathtakingly green land, covered by coconut palms, lagoons, sunny beaches and waterfalls, offers a soothing and festive mood. The scenery changes across the breadth of the state, and is dotted with Lush plantations, waterfalls, fresh springs, and forests full of the opportunity to spot unique species of birds and wildlife. Best Wild Life Sanctuary in Kerala Periyar Wildlife sanctuary is a popular wild life sanctuary with various species of animals including elephants, tigers, sambars, gaurs and lion tailed macaques. 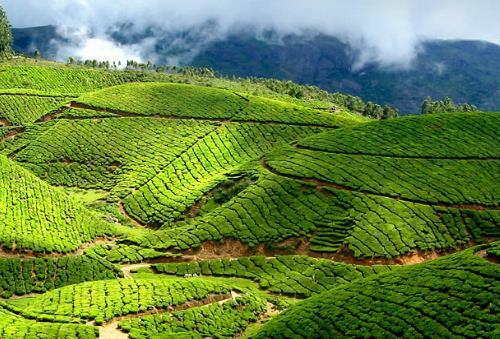 Munnar Sprawling tea plantation, forests, hill ranges, greenery, picture book towns, winding lanes, wildlife and holiday facilities make this a popular hill station. Kochi Kochi is always the starting point for most of the Kerala tour packages. Snake Boat Race : traditional boat race Snake boat races take place from july to september each year. The backwaters of Alleppey come alive with the rivers becoming flush after the rainy season. Most popular beach destination in Kerala. Kerala has been mentioned as one of the 50 greatest places of a lifetime in the world by national geographic magazine. And in Kerala, the season never ends, thanks to the year-long moderate climate and numerous festivals and events. Geographically, Kerala is a heady amalgam of Nature’s very best. Emerald paddy fields. Virgin forests. Limpid backwaters, and beaches by the dozen, which in the days of yore, lured adventurous hearts from all over the globe.Kerala is God’s own land, untouched and unparalleled. Kerala is a tropical paradise far from the tourist trail at the southern Peninsular tip. With seductive beaches in quiet seclusion, flanked by cliff, headland and palm. With the dream-like serenity of its enchanting backwater and lagoons. With ancient temples and lovely palaces that make you forget the age you are in. As does shopping for antiques, cashew and gold. With nature cures and herbal massages that tone up your body, mind and soul, and with thick evergreen reserves here wild color and wild life run riot, Geographically Kerala is an exotic mixture of nature’s very best, .emerald paddy fields. virgin forests, backwaters and beaches by the dozen.